Kids of all ages love magnetic tiles! They’ve become hugely popular because they offer a fun and unique building opportunity that will allow your child’s imagination and creativity to soar. We’ve put together this list of the best magnetic tiles for kids because not only are they totally fun to play with, but they’re also good for your child in many ways. They’re an awesome STEM toy that can improve your child’s fine motor skills, teach them color recognition, counting, sorting, and stacking skills. They also help develop your child’s spatial awareness and problem solving skills, and they’re a great way to get kids off of electronic devices. But best of all in our minds is that they’re a great way for the whole family to spend some wonderful, creative bonding time together. So we’ve sorted through hundreds of sets of magnetic tiles to present you with an awesome list that contains only the best magnetic building toys. We’ve made sure that every set on our list is safe, fun, high quality, durable, and gives you great value for your money. We’re confident that you’ll find a magnetic tile set for your child whether they’re just starting to explore the fun world of building, or they’re eager to construct their first phenomenal skyscraper. This Picasso Tiles 60 Piece Magnetic Tiles Set is sure to provide you child with hours of building fun! It has different sizes and shapes of tiles and comes with 4 large square tiles, 24 small square tiles, 18 small triangle tiles, 8 medium size triangle tiles, and 6 large triangle tiles. 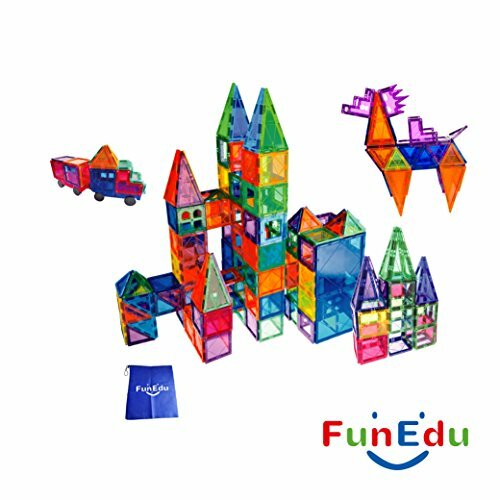 This awesome STEM toy will allow your child to create a lot of different building designs, including 3D designs. And they’re great for color recognition, counting and sorting, improving your child’s creativity and developing your child’s fine motor skills. Ideal for either solo or group play, your child will love exploring the world of building with Picasso tiles. Plus you also get a storage box, making clean up quick and easy and taking them somewhere very convenient. Although these Picasso tiles are recommended for kids 3 and up, many parents state that their 2 year old enjoys playing with them. And one of the best things about this 60 piece Picasso tile set is that not only can it be added to other Picasso tile sets, but it’s also compatible with other magnetic tiles, including Magna-Tiles and Playmags. So the construction and creativity experiences are endless! 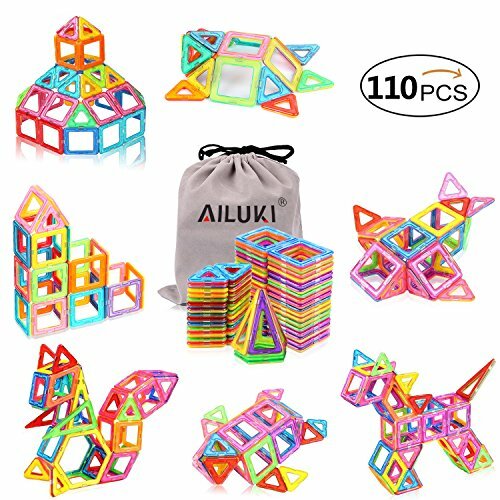 This Ailuki 110 Piece Magnetic Building Tiles Set will provide your child with hours of building and learning fun! The multi colored tiles are made from durable, non toxic ABS plastic and the set contains tiles of different sizes and shapes. There are 40 squares, 60 triangles, 6 long triangles, and 4 pentagon shapes. The set also comes with a handy storage bag, and an instruction booklet that will show your child how to build various structures. Not only does this set of magnetic tiles provide your child with hours of open ended play, but it’s also a great way to teach them colors, counting, sorting and sizes. They’re also a wonderful way to develop your child’s creativity, imagination, fine motor skills, and hand-eye coordination. Ailuki tiles have rounded edges so your child won’t poke themselves and they’re compatible with other magnetic tiles, including Magna-Tiles and Magformers. Great for both solo and group play, the recommended age is 3 and up, but kids as young as 2 can also have fun with these magnetic tiles. Even older kids and adults find themselves building with these tiles, making them a wonderful family bonding activity. Kids have a blast building with them! These magnetic tiles will keep your child happily building for hours. If your toddler loves to build things then the Playmags 100 Piece Super Set of Magnetic Tiles will provide them with hours of creative fun! This set comes with 26 small squares, 14 open windows, 2 windows that have 4 open sections in them, 10 right angle triangles, 8 acute angle triangles, 12 equilateral triangles, 8 rectangles, and 2 large squares. One really cool feature is that this Playmags Super Set also includes 13 ABC and number Clickins and 5 window Clickins, giving your child even more creative possibilities. Kids love using the Clickin tiles to add their initials to their building projects, spell out fun words, or put their favorite numbers on what they’ve created. The Clickin tiles really add to the building fun! Another great feature about this magnetic tile set is that in addition to building with them, your child can also use them for early learning. They’re a wonderful way to learn about color recognition, shapes, sorting, counting, and letter and number identification. They’re also an ideal way for your child to improve their problem solving and fine motor skills. Playmags are compatible with other magnetic tiles, including Magna-Tiles and Picasso Tiles, making for even more building fun. They also have very strong magnets to ensure that even the tallest structures hold together well. This set with a convenient storage bag for easy clean up, plus an idea booklet to get your child started. The Playmags Super Set is recommended for kids 3 and up but parents state that kids as young as 2 can use them also. And even teenagers and adults can’t resist testing their construction skills with this awesome magnetic tile set. Playmags are a fun STEM toy that provides your child with limitless building possibilities as they explore their creativity and expand their imagination! They provide hours of fun for kids of all ages! The Dreambuilder Toy 96 Piece Magnetic Tile Set is a great building toy for kids of all ages! This set comes with both magnetic tiles and non magnetic items. The colorful magnetic tiles are made from ABS materials and include 20 small triangles, 4 long triangles, 24 squares, 2 hexagon tiles, 2 semi-circles, and 2 rectangle tiles. The non magnetic items include 2 sets of wheels, 1 Ferris Wheel set consisting of 8 pieces, and 24 alphanumeric cards. Kids love this Dreambuilder Toy set because the wheels and the Ferris Wheel set add to the fun. On top of the more traditional things kids build with magnetic tiles, such as houses and animal shapes, the non magnetic pieces in this set allow them to use their creativity to construct unique things, such as different types of vehicles. Another thing kids think is really cool is that they can use this set to build all kinds of 3D structures. 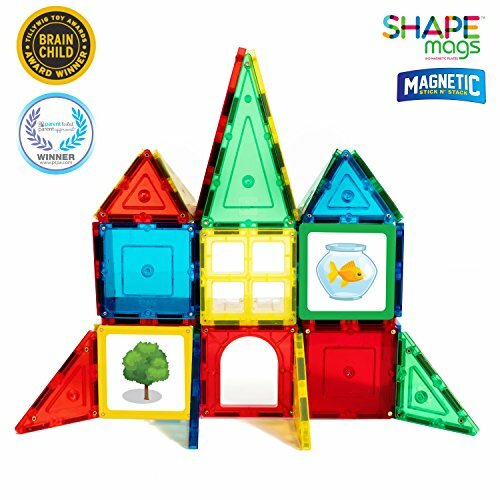 Not only does this magnetic building set provide your child with hours of building fun, it also helps them to learn to count, identify colors, recognize shapes, and helps them practice their sorting skills. This magnetic tile set is best suited to kids who are 2 years old and up. The alphanumeric cards are a great way for your toddler to learn letters and numbers. This set of tiles is large enough for 2 or more kids to play with together. Even adults enjoy getting in on the architectural fun, so it’s a great toy to encourage some parent/child bonding time. If you’re looking for a toy that will capture your child’s attention and get them away from those computer games, check out this Dreambuilder Toy Magnetic tile set! This set will provide hours of fun for kids of all ages! The Magformers Basic Set of Magnetic Building Tiles comes with 62 pieces that are different shapes, sizes and colors. This magnetic tile set consists of 20 triangles, 30 squares, and 12 pentagons. The brightly colored tiles are made from durable BPA-free plastic, and the set also comes with a step-by-step booklet. These tiles are ideal for younger kids because they’re smaller than other magnetic tiles and have hollow centers which makes them easier for little hands to hold. The booklet that comes with the Magformers Basic Set is great for encouraging kids to build initially. But it won’t be long before your child is coming up with their own awesome creations and even asking for more Magformers to build larger and more complex structures. Magformers can be used for both 2D and 3D building. They’re a great way to help kids learn how to identify colors, practice sorting, stacking, and counting. They also help improve your child’s fine motor and critical thinking skills. These blocks are recommended for kids 3 and up and the magnets are securely enclosed within the blocks so they don’t pose a swallowing hazard to young children. 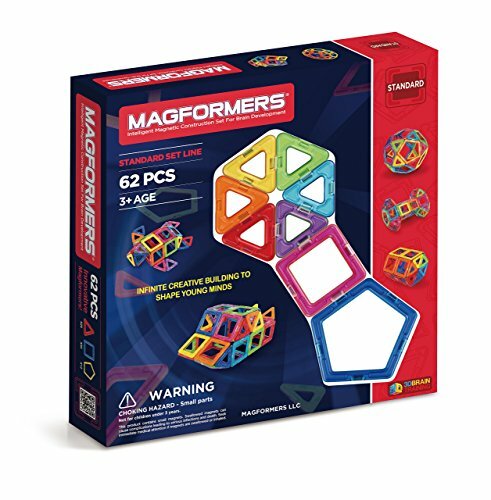 The Magformers Basic Set of magnetic tiles is a wonderful way to get your little ones started and on the road to building exploration and fun! Kids really enjoy building with these tiles! If you have an aspiring builder in your family, they’ll love the Picasso Tiles 100 Piece Magnetic Building Tiles Set! This award winning set consists of 8 large squares, 46 small squares, 20 small triangles, 12 medium triangles, and 14 tall triangles. The see through tiles come in a variety of bright colors and are compatible with other Picasso tile sets as well as Magna-Tiles and Playmags. This large set of tiles will give your child plenty of building fun as well as help them improve their color recognition, and sorting and counting skills. 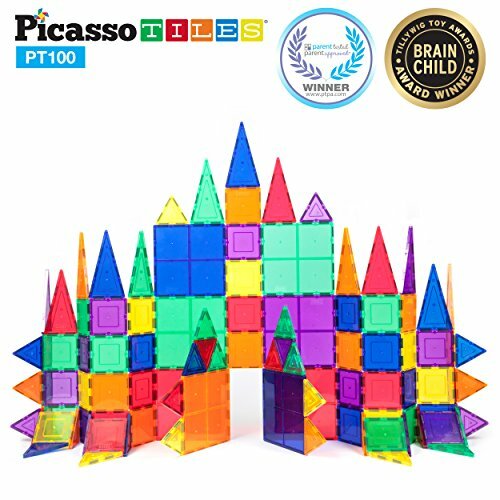 This 100 piece set of Picasso magnetic tiles should give your child enough tiles to take on large building projects as well as allow them to share the fun with siblings and friends. Kids love to use this set to tackle anything from small buildings to larger structures and even really tall skyscrapers. This set of Picasso tiles will provide your child with hours of building fun as they take on bigger and bigger projects. Although they’re recommended for kids 3 and up, they’re suitable for kids as young as 2. And don’t be surprised if the whole family wants to join in the fun! Why not let your child get creative with these awesome building tiles and see where there imagination will take them? Kids love that there are so many tiles in this set, giving them tons of building options! This award winning Magnetic Stick And Stack 40 Piece Junior Set is a really fun beginner magnetic tile building set. It comes with 32 regular tiles, including 4 long triangles, 4 wide triangles, 8 regular triangles, 12 solid squares, 1 open center square, 1 double door square, 1 arched door square, and 1 window. This set also includes 8 of Stick And Stack’s patented Stilemags. Stilemags have pictures on them and they’re a great way for your child to add something fun to their building project, making it more unique. The pictures on the Stilemags include a bus, a tree, a dog, a fish in a bowl, a stop light, a police car, an ambulance, and a fire truck. The Stick N Stack Junior Set comes in its own storage box, making it easy to clean them up and keep them together. And they’re compatible with other magnetic tiles, including Magna-Tiles and Picasso Tiles, so your child can mix and match for even more building fun. Kids love the Stilemags and they enjoy how different they can make their structures look using them. Kids also think it’s cool that these magnetic tiles will stick to the refrigerator and any other flat metal surface. This 40 Piece Junior magnetic tile set will allow your child to unleash their creativity as well as improve their color recognition, counting, stacking, and sorting skills. They’re also a great way to develop your child’s critical thinking and fine motor skills. While the set is small, it’s a great beginning building set for younger kids who are just developing their skills. This 102 piece set of Lazy Monk Magnetic Tiles For Kids is a fun way for your child to develop their creativity, building, and early learning skills. The set includes both magnetic and non magnetic pieces and all the pieces are made from BPA-free, non toxic material. They also have rounded edges so they won’t hurt the hands of young builders. This Lazy Monk set is made up of squares, triangles, hexagons, and rectangles, number and symbol tiles, and alphabet tiles. 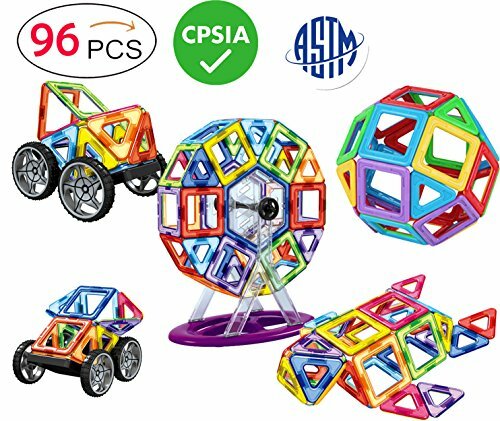 And for even more building fun, your child will also get an 8-piece Ferris Wheel set and 2 pinwheels which they’ll really enjoy putting together. On top of all that, there are also 2 invisible ink pens included in case your little architect wants to draw up some secret plans for their building projects. With all the different types of pieces in this set, your child is sure to have lots of fun building all sorts of different things. This magnetic tile building set is really versatile and can help your child practice early learning skills such as color, number and letter recognition, sorting, counting and shapes. Although they’re recommended for kids 3 and up, many parents state that kids as young as 2 can use them also. This set provides you child with plenty of building materials whether playing alone or with friends, siblings, or parents. In fact, since adults love building with these tiles as much as kids, these tiles make for some great family bonding time. These magnetic tiles provides your child with hours of fun! 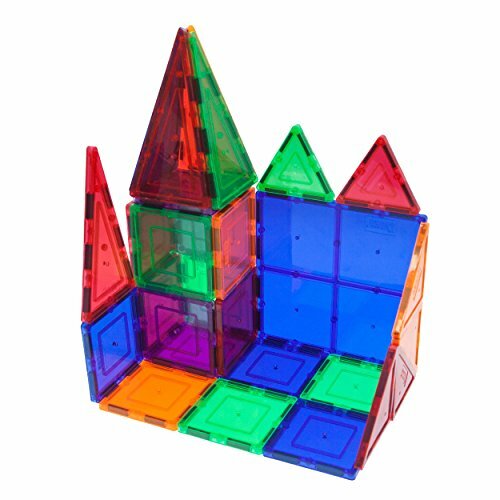 The Magna-Tiles Clear Colors 100 Piece Set is designed to help your child develop basic problem solving skills while having fun building a variety of different things. This set includes 50 small squares, 4 large squares, 15 isosceles triangles, 11 right triangles, and 20 equilateral triangles. One of the features parents like the most about Magna-Tiles is they have metal rivets in the corner which hold the magnets in. That, combined with very strong magnets, allows your child to build large structures that hold together really well. Magna-Tiles are a great way to improve your child’s early learning skills such as colors, patterns, sorting, and shapes. And because this set has 100 pieces, it’s perfect for either solitary or cooperative play. This large set of tiles can be added to by other Magna-Tiles sets and it’s also compatible with other magnetic tiles, including Playmags. 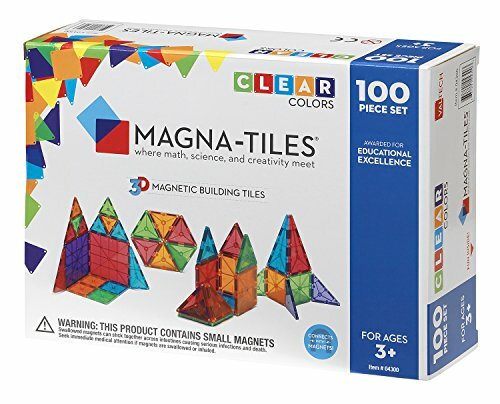 Magna-Tiles are definitely one of the most well known of all the magnetic tile sets and they’re also the most expensive. But many parents say they’re well worth the money because they hold together well and last for years and years. While this tile set is recommended for children 2 years and up, kids of all ages enjoy them. Even teenagers and adults love to get in on the fun! Kids of all ages love playing with Magna-Tiles! This 118 Piece Magnetic Tile Building Blocks Set by Vcanny comes in all of the colors of the rainbow. It consists of 32 squares, 26 triangles, 6 long triangles, 4 diamonds, 2 trapezoids, 2 small rectangles, 2 semi-circles, 2 hexagons, 2 car wheel bases, 1 Ferris Wheel, a storage pouch, and instructions. You also get 26 alphabet letter cards, and 16 number cards, which fit into the open center of the square tiles. Made of non-toxic ABS plastic, these tiles are not only great for building, but also help your child with early learning skills such as color recognition, counting, shapes, sorting, and learning to recognize their numbers and their letters. This tile set is compatible with other similar size magnetic tiles so they make a great stand alone building set or add-on to existing sets. With 118 pieces, it’s large enough for your child to use on their own or to share with others, which helps develop and strengthen social skills. These tiles are recommended for children ages 18 months and up and they are enjoyed by kids of all ages and anyone else who loves building! 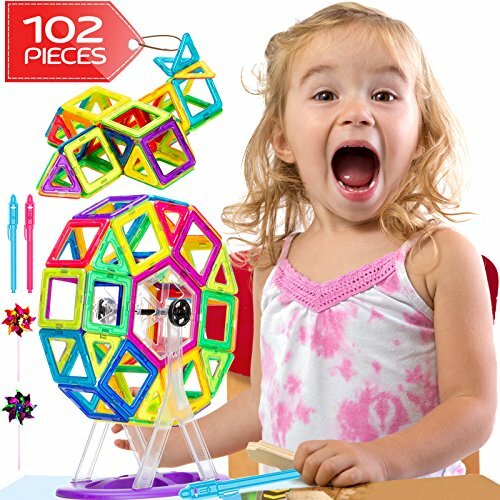 This magnetic tiles building set provides hours of fun for your child! The FunEdu 100 Piece Magnetic Tiles Building Set is a great building set for kids of all ages! 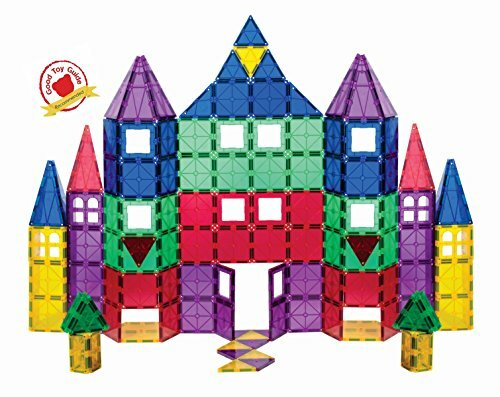 Made from non-toxic ABS plastic, this set includes 16 small triangles, 4 wide triangles, 8 long triangles, 2 large squares, 28 small squares, 12 embossed animal squares, 4 stair pieces, 2 L shaped pieces, 2 Arch windows, 2 crown pieces, 2 flame pieces, 6 rectangles, 6 rails, 2 trapezoids, and 2 car bases. It also comes with a convenient storage bag and an instruction book with some ideas to get your child starting on their fun building adventure. Kids especially love the animal tiles, stair pieces, and the car bases because those pieces allow them to be even more creative and build all kinds of cool things. These magnetic tiles make terrific learning tools for younger kids. Your child can use them to practice identifying colors and shapes, counting, stacking, and sorting. They’ll also enjoy identifying the animals on the picture tiles. Older kids will enjoy using these blocks to build all kinds of complex things and fun vehicles that they can play with until they decide to break them apart and build something new. Parents like that this set of magnetic building tiles has some unique pieces that most other sets do not have. Best of all, this set has enough pieces that your child can share, making building time even more fun. Although these tiles are recommended for kids 3 and up, this set is compatible with other magnetic tiles, including Magna-Tiles. 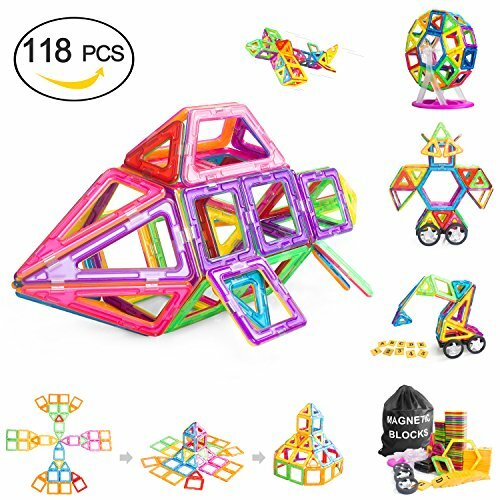 This open ended STEM building toy allows your child’s creativity and imagination to shine through as they build all sorts of fun creations that they’ll love showing off! These tiles provides kids with hours of fun! 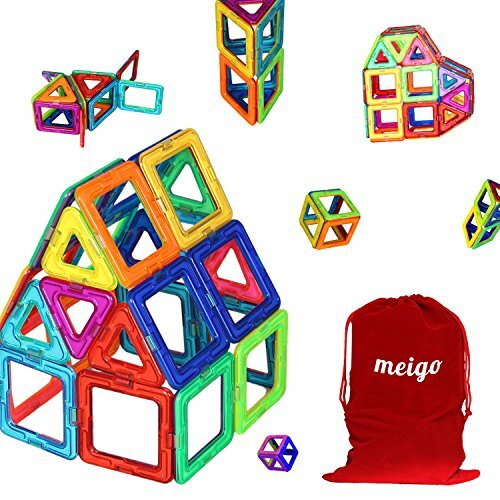 The Meigo Magnetic Building Tiles make a great starter set for kids who are just beginning to show an interest in building. They come in either a set of 30 or 70 tiles. The 30 piece set contains squares and triangles, while the 70 piece set comes with squares, 2 sizes of triangles, pentagons, and hexagons. Both sets come with and instruction book and a convenient storage bag to store the tiles when they are not being used. Meigo magnetic tiles are made from food grade, non-toxic ABS plastic. They have rounded edges to make them more comfortable for small children’s hands. The set of 30 tiles is perfect for young toddlers just trying their hands at building. As your child’s building skills grow, you can add the 70 piece set in, giving your child 100 pieces to build with. Young children will enjoy using these tiles for color recognition, counting, stacking, and sorting. They’re also a great way to develop your child’s creativity, fine motor skills, and problem solving skills. These magnetic tiles are recommended for kids 3 and up, but most parent state that 2 year olds love playing with these magnetic tiles as well. Like all magnetic building tiles, the Meigo tiles will provide your child with hours of building fun. The magnets hold each tile together well. This Jolly Mags 32 Piece Magnetic Tile Set proves that great things can come in small packages. The set comes in vibrant primary colors and consists of 16 squares, 4 wide and short triangles, 4 tall triangles and 8 medium size triangles. This Jolly Mags tile set will allow your child to practice their color recognition, counting, sorting, stacking, and matching skills. It’s also a great way to improve your child’s imagination and creativity. 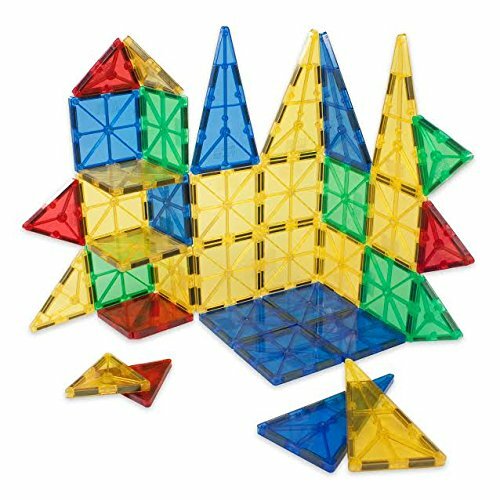 The set is compatible with other magnetic tiles sets, including Magna-Tiles, so your child can mix and match for even more building fun. And as your child’s building skills improve, you can add to this set to allow them to build more complex things. Kids love using the Jolly Mags in the tub because they think it’s really cool that their 2D structures float but 3D structures sink. This building tile set is recommended for kids 3 and up, and parents state it can be used by younger kids under supervision. If you’re looking for a great beginner magnetic tile set for your toddler, this Jolly Mags set is definitely worth considering. Jolly Mags are quite solid and stand up well to being throw, falling off the table, and more. 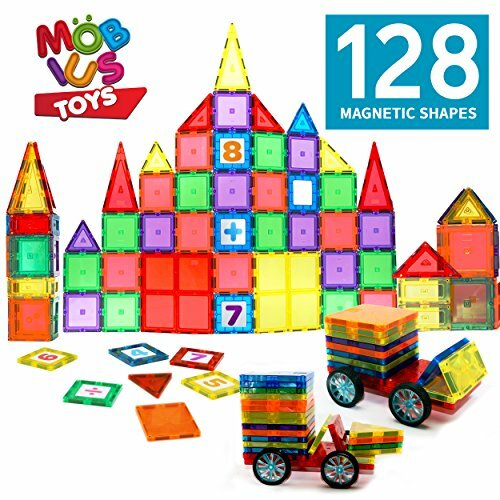 This 128 piece Mobius Toys Magnetic Tiles for Kids set will provide your child with many opportunities for creative building. Made with metal rivets to securely hold the magnets inside each tile, the set comes with 56 square pieces (in three different sizes), 42 Triangular pieces (in three different shapes and sizes), and 2 wheel sets. Also included in this magnetic tiles set are 16 number and math symbol tiles, and a storage bag. The number and math symbol tiles fit into the center of the open squares. Not only are these tiles great for building everything from simple objects to tall structures, they can also help young children develop beginning skills in color and number recognition, sorting, stacking, shapes and even early math skills. These magnetic tiles are a wonderful STEM toy to share with friends and siblings. And because this is such a large set, it will grow with your child, allowing them to expand their building creations as their building skill improves. Although it’s recommended for kids 3 and up, many parents agree that kids as young as two2 love to play with these tiles. Kids of all ages think this set is tons of fun to play with!